baskin robbins | Gluttoner: You gonna eat that? With this morning’s wedding of Prince William to Kate Middleton everyone is catching royal wedding fever even Dunkin’ Donuts and Baskin Robbins. 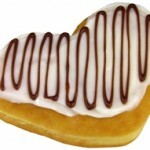 DD is offering up a special limited time only heart-shaped glazed jelly filled Royal Wedding Donut.